What a great event! The 5th Annual K.O. Propo GP was an outstanding event, and with 140 entries it was one of the biggest nitro on-road races on the west coast in some time. Big thanks go out to Brian Thomas for putting the race together and making sure the program ran smoothly. Even the "Fabulous" Barry Baker was on the mic all weekend to keep the racers entertained and under control! I made the 6 hour drive down to Los Angeles from Sacramento with my mechanic Otto Rosa, and fellow Serpent/Novarossi racer Ryan Crabtree. Friday was a practice day with one round of qualifying at the end of the day. We did our best to have everything prepared, and that included our new S747 Serpent sedan which had arrived at my house only 7 days before we left for the race!. Otto did an incredible job of meticulously building the car, and was finishing the final touches when we arrived at the track on Friday. We began by running my Novarossi powered 966TE that was fresh off its win in Houston so we could get that car set for qualifying. Things went smoothly and after a few minor changes we felt we could at least be ready to run the first qualifier. We turned our attention to the S747 and finished the final details to get the car on the track. The first run went fairly smooth and I could feel the potential of the car right away. We did not have to worry about the engine package at all as my Novarossi engines are consistently super fast and reliable, the best in the industry! Unfortunately, by the time we got to the point, practice had ended! only one run on the new car and now it was time to qualify. When the dust settled from Fridays qualifying round, I was 1st in 1/8 and 5th in sedan..... not a bad start to the weekend! Saturday proved to be a very exciting day. There was great racing with ever heat race that took the track, and I had my own personal battle raging with Mike Swauger......... With every round and in both classes, we went back and forth, trading TQ spots, racing very close together on the clock, and it didn't end until the last lap of the last qualifier in both classes! When it was all said and done, Mike edged me out for TQ by one tenth of a second in sedan, and six tenths in 1/8...... incredible racing! Even though I was disappointed to miss TQ, I was still very happy to start 2nd in both classes, especially in sedan where the S747 had come a long way in just 5 runs on the track! Paolo Morganti was also running the new S747, and qualified 4th for the grid on Sunday. Ryan did a great job as well, making the Final in both classes. We made our way to the track on Sunday, and enjoyed a full day of racing action. The first final up was Sedan. With tire wear pretty high, I knew there would be lots of different strategies for the 30 minute Finals. As the race got underway, Swauger led and I battled with D.J. Apolaro for 2nd. As the race went on, both Swauger and Apolaro would have incidents on track that would force them back. I moved to the lead with Paolo following in second. With only a few minutes to go in the race Paolo and I were only separated by about 4 seconds, but then he had a small pitting issue and dropped back to finish in 3rd place. 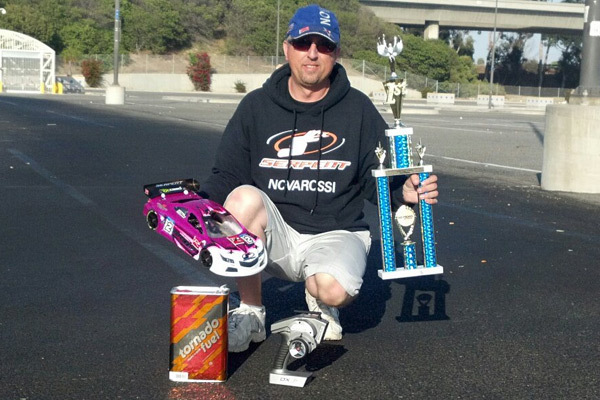 My car was smoooooth as butter all race and it was great to give the Serpent S747 a win in it's first race out! Diatta Collymore finished up in 2nd and Paolo finished 3rd, giving Serpent/Novarossi two of the podium spots for sedan. As if that race wasn't exciting enough, the 1/8 final had even more in store......... Right from the green flag, Swauger led with me following in second.... This was going to be another race of patience as I knew Mike would be trying to open a lead and pit early, and possibly take a tire change. I could easily go 5 minutes with my Novarossi engine and would not be changing tires. I tried to keep the distance close, and as the race went on, my car was getting better and better. At the 20 minute mark, Mike had still not changed tires so I was now assuming he might try to go the distance on one set. This was okay as my car was still getting faster and I was now closing his lead. With only 6 minutes to go in the race, I had closed to just 5 seconds behind and I only needed one final pit stop to Swaugers two needed stops. It was shaping up to be a wild finish, and then BAM my car drove itself right through the end of the backstraight wall with no warning. A few laps before this happened I had felt a little "wiggle" in the car that did not come from me and I wasn't sure what it was.... this time it was certain, I had no control of the car just before I turned in at the end of the straight, and now our day was over. Very unfortunate, but that's racing..... Mike went on for the well deserved win, with D.J. Apolaro 2nd, and Brian Thomas 3rd. After getting back home and assessing what happened, we discovered a short in the battery that appears to have caused the problem. All in all, we had a great time, and some good results! Thank you to all of my fantastic sponsors: Serpent, Novarossi, Serpent America, DeSoto Racing, Spektrum, Tornado Fuel, Xceed Tires, A-Main Hobbies, Empire Racing, Avid Bearings, Protoform. Thank you to everyone at the GLARC club and K.O. Propo for the great event, and stay tuned as I report on the next event in July, The Timezone Gran Prix!